Katy Duffield has written more than twenty books for children. She lives in Florida with her husband. Campbell's pen, watercolor, and colored pencil illustrations keep the focus on the central action, though there are enough tantalizing details of the alien world to whet readers' appetites. Mama Alien is pink, Daddy's blue, and their son is green. All are expressive. Kids who are ill here on Earth may be entertained by this look at one alien's cold and his family's attempts to make him feel better. Anyone with a cold will find comfort in the company of this sick little alien as he sneezes with increasing ferocity. 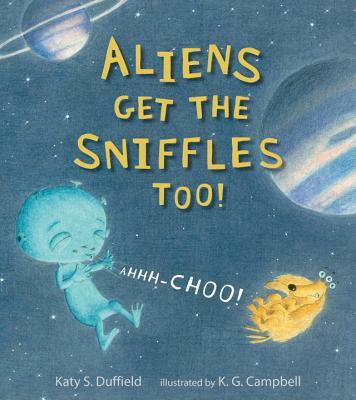 Aliens Get the Sniffles, Too! is a good add to picture book collections – we can never have enough sick day books! The perfect addition to any stocking.